I just returned from a week-long tour of Scotland, and boy, I wish I could have made it longer. It's one of the best and easiest countries to visit, in my opinion; full of amazing things to do and see, as well as some of the nicest people I ever met. It all started when I ended up with a canceled plane ticket that I had to use within a year. But since it was a very busy year (a new startup - check out ExPOS, if you haven't already), I left the decision to literally the last month. By then, most of the destinations I wanted were over the ticket's limit. 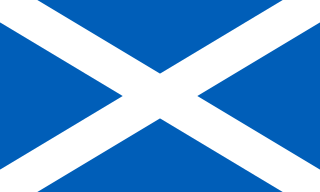 Iwanted to visit Scotland for the last 7 years. I've been all over the UK, Ireland and N. Ireland, literally on the border with Scotland, but never got to visit it. Now I had my chance. 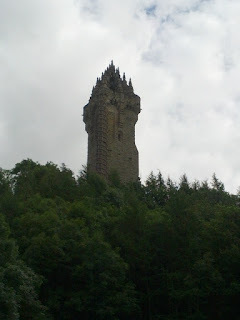 After landing at Glasgow airport and picking up the only automatic car Hertz had (I can drive shift, but shifting with my left hand is another issue all together), we headed for the city of Stirling. 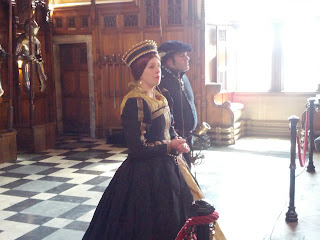 Full of history, with a nice town center, we had lunch and proceeded to Stirling castle. The place is full of history and interesting things to see and do. 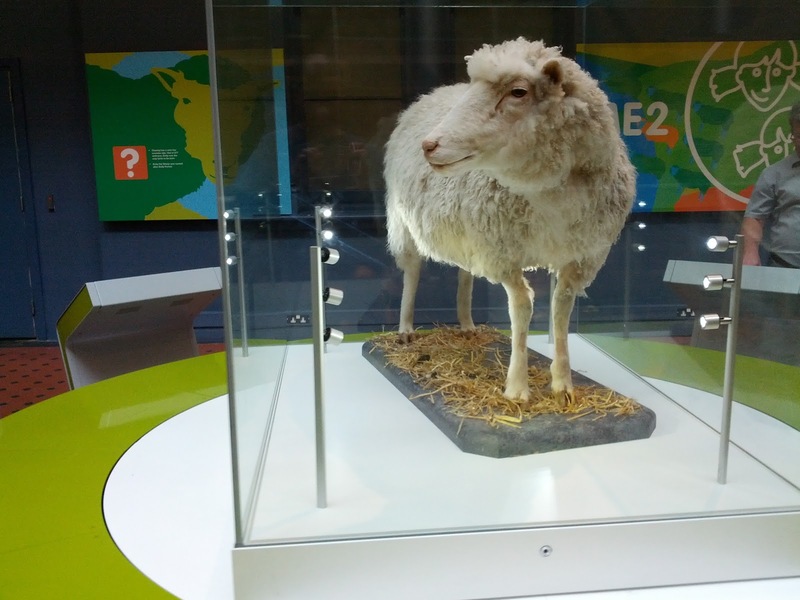 It also hosts some museums covering history, archaeology and military. The vistas from the castle walls is amazing, showing Stirling, the fields, the river and the William Wallace monument. This is where, with a little planning, we could have saved some money. Apparently you can buy a ticket that covers entry to all the castles we later visited saving us not only money, but time standing in line. I highly recommend pre-purchasing such a ticket online prior to your visit, if you plan on visiting castles in Scotland. A short car ride brings you to the William Wallace monument. You can't miss it - it's a tall tower on a high hill. We opted to walk up the hill to the tower (you can take a van) and started climbing the narrow, circular stairs. 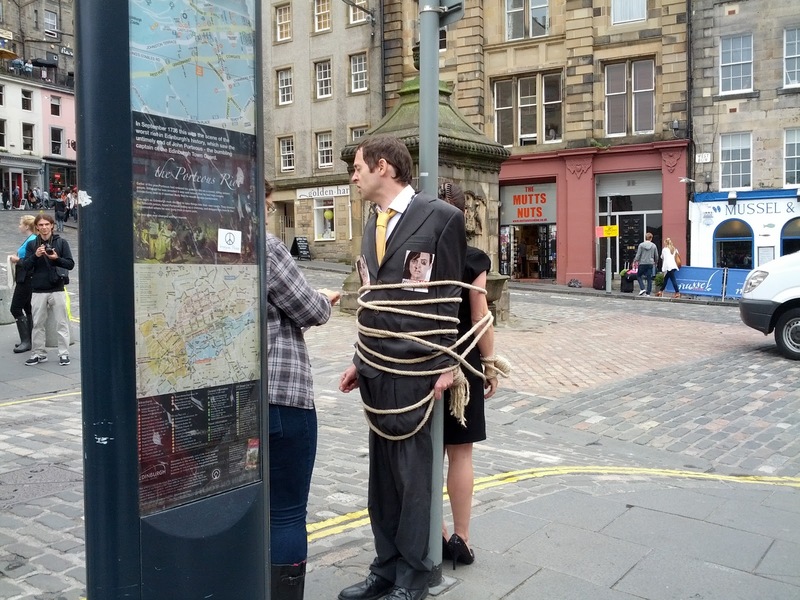 Every landing has a small museum with more information about William Wallace, his achievements and his death, including a chilling multimedia presentation of his trial. William Wallace was immortalized in Mel Gibson's movie "Braveheart", which doesn't sit well with the Scottish. You see, "Braveheart" was actually the nickname of the king Robert the Bruce, not of Wallace's himself. And the movie is full of other mistakes, as every Scottish tour guide would be glad to specify. However you stand on the matter, it was an interesting visit. We haven't calculated the distance we had to climb well, and with every landing, we were sure we reached the top. 246 stairs later, we have, and it was well worth it! The top of the tower is open and affords 360 degree views of the area. From there, we continued up north to the Highlands and Cairngorm park. We booked a hotel at the center of the park, near a little town called Aviemore. We took the funicular up to Cairngorm mountain - the 6th tallest in the UK - to look at the whole park. You can also walk up, if you so choose. We saw lochs and glens all around us, and decided to visit a couple. 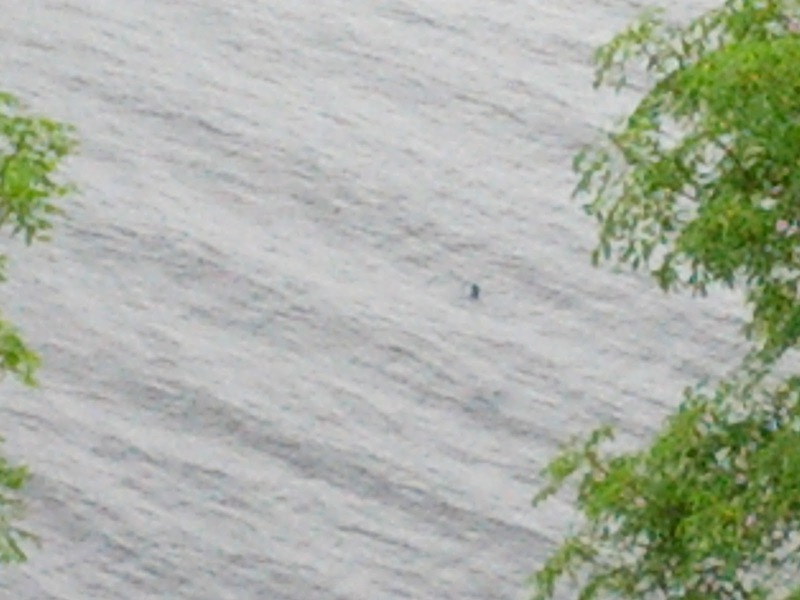 It took 2.5 hours to circle the lake - about 5.5KM, if memory serves. From there we continued to the town of Aviemore for a spot of lunch. From there we continued to a smaller loch called Loch an Eilein - the lake of the island. 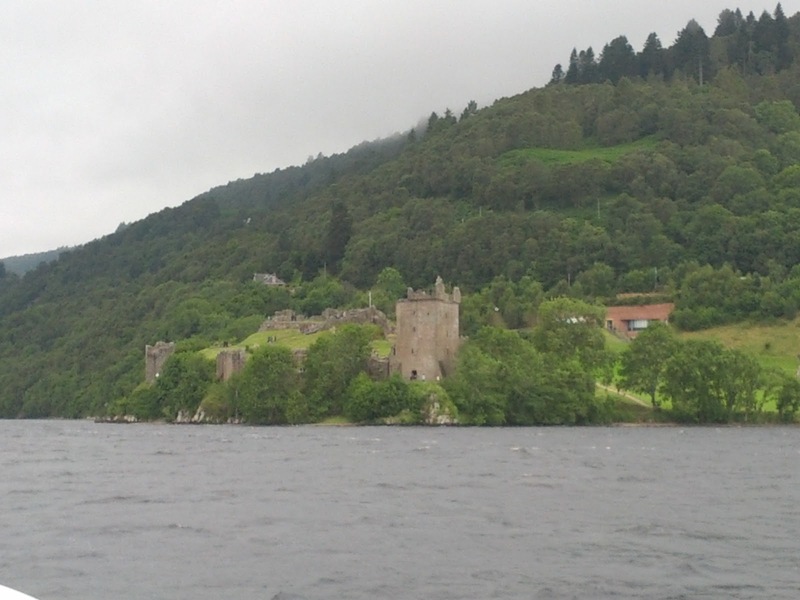 In the middle of the lake, on an island, stand the ruins of a small castle with some interesting history. 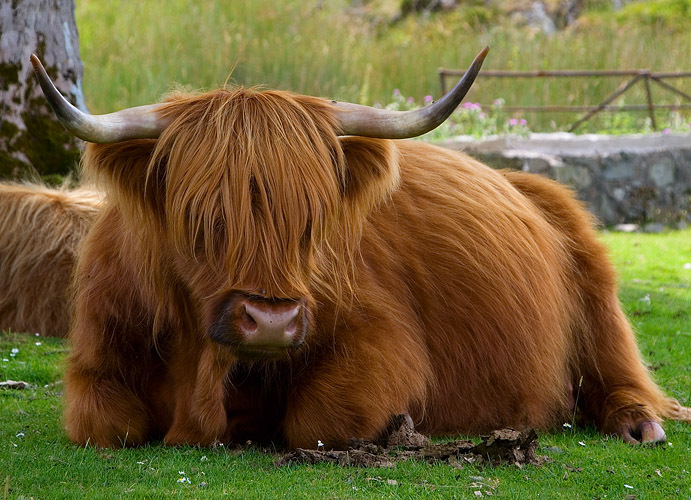 We also got to see some Highland cows, which sadly did not wait around to be photographed. These are big furry animals, fed on grain left from whiskey distillation process - making them the happiest cattle on Earth, I guess. 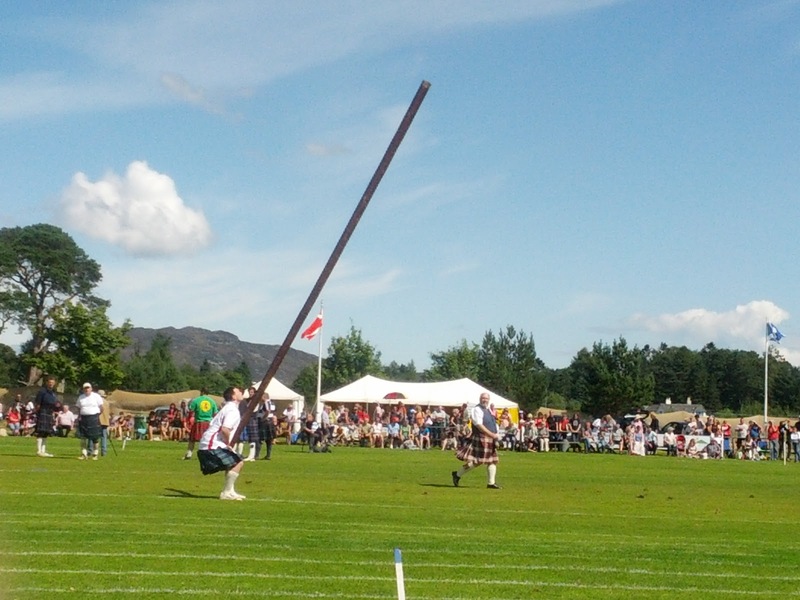 We decided to attend some Highland games and found that Clan McPhereson held their annual gathering at the town of Newtonmore, just beyond the park's border. It was a glorious sunny day and the games turned into a great happening, with clan members arriving from all corners of the Earth. It gives them a chance to meet and wear their traditional kilts and suits. And of course, compete. Some of the games are traditional athletics, such as running, jumping etc. But some are unique to the Highlands: bagpiping, Kayliegh dancing, Caber toss, and the Scottish hammer. We got good seats and pretty soon found someone to cheer for. After sampling some of the local whiskeys, we headed to the closest distillery, the Dalwhinnie. After learning about the distillation process and sampling some more of the fine fire-water, I was disappointed to find out that one large company now owns most distilleries in Scotland and that the distillery's store now sells single malts from all of them - putting aside years of rivalries and claims for excellence. From what I've learned, all single malts are made from the same 3 ingredients (barley, water and yeast) and the only differences between them are the water quality and the length of the process. 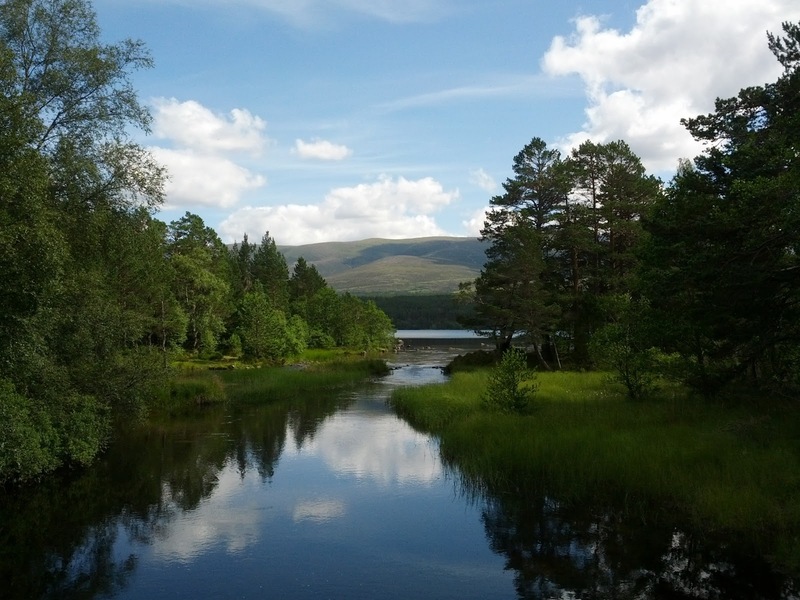 W continued down the winding road to Loch Laggan, but the nagging rain ruled out a walk. By the way, if you don't like rain - stay away from Scotland. It rains all year long (even if the temperature remains warm). As I was told by at least 3 different people (which makes it an official Scottish joke, I guess): "Summer? oh yeah, that was last week. We called it Wednesday". We took a cruise of the lake. It is quite deep and gets very deep very close to shore. 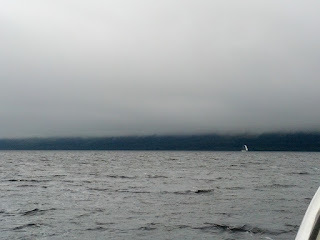 The loch looks very mysterious, with mist coming down from the hills, and Urquhart castle overlooking it. You can feel the history and the weirdness of the locale, driving people to believe in the loch's supernatural qualities, as far back as the 6th century. 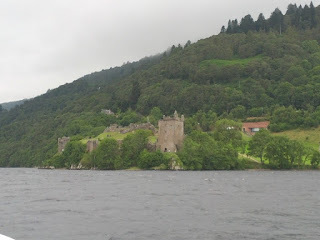 We proceeded to visit Urquhart castle itself - well worth the visit, as you learn about life at the castle and the several battle held and lost there. We then proceeded to drive down to Edinburgh - Scotland's capital - through a torrential rain. 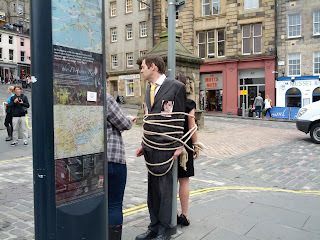 We took a walking tour of the city, and saw many of the interesting spots in old town. We then proceeded to the National museum and learned a bit more about Scotland's history and contributions to the world, including a nice communications exhibition, Dolly the cloned sheep and some old vehicles. The roof of the museum provides great vistas of Edinburgh and the castle. 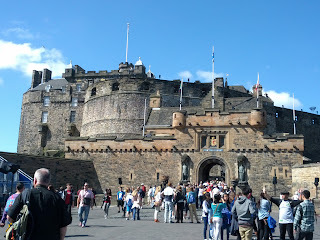 Today we took the time to tour Edinburgh castle in full - a 3-4 hours trip. Prepare for a 45 minutes wait for the ticket line (again, order tickets on the internet to avoid). 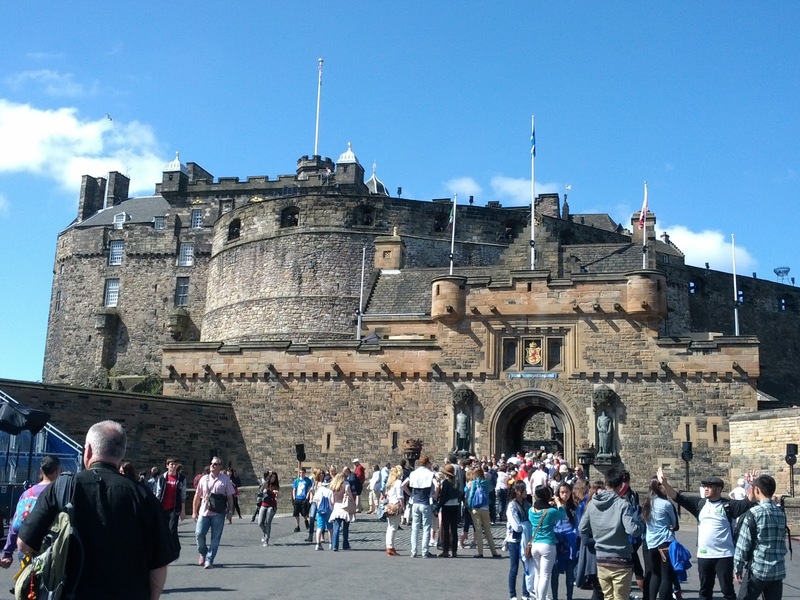 Another great castle, with tons of history and things to see and do. There are actors re-enacting some of the castle's famous inhabitants, such as a very funny audience we had with "Queen Mary" and her castelan at the castle's great hall. And with that, we headed west to Glasgow, to prepare for our separate trips back home the following morning. But this post can't be complete without adding some tech to the travel. A week prior to my trip, I bought a Google Galaxy Nexus phone. At the time of the writing, it's the first and only phone to support penta-band GSM radio, and Jelly Bean (Android 4.1). It cost $350 and comes unlocked, with the promise it would work everywhere on Earth. And it delivered big time. At Stirling I bought a local SIM card for a provider called '3' for 15 pounds ($22). I got a month of unlimited 3G data and 300 minutes of talk. This allowed me to use the phone as a GPS everywhere, use it's tethering capabilities to get internet service for my iPad, and use Skype to call peoples' phone in the US and Israel. All in all, much better than what other cell providers here call "roaming" (and I call extortion). Do yourself a favor: get an unlocked phone, get a pre-paid, no-subscription program with data (this phone, for example, works with AT&T and T-Mobile in the US, and any other network on Earth) and use a local SIM card wherever you travel. Much cheaper than the alternative, and you are not bound to greedy, outdated corporations.